It’s not an accident that Northerners pay some of the highest power rates in the world. If an energy provider has millions of users, it’s easier to spread out the upfront construction costs of hydro plants, solar arrays or wind turbines to keep rates low. Now consider Canada’s North: fewer than 100 communities scattered across one-third of the country’s landmass, with a combined population base of little more than 100,000 residents. The economies of scale are miniscule. Add to this the near impossibility of connecting communities together on a power grid due to the sheer distance between towns, coupled with a shortage of vital transportation infrastructure, and it starts to make sense why, even with generous government subsidies, the rates up here are as much as six times higher than down south. Now consider Canada’s North: fewer than 100 communities scattered across one-third of the country’s landmass, with a combined population base of little more than 100,000 residents. The economies of scale are miniscule. That helps explain the North’s admitted addiction to diesel. Some jurisdictions are better than others: the Yukon, blessed with a more developed road network and fewer communities, is further ahead than the NWT in weaning itself off fossil fuels. Nunavut, on the other hand, is entirely diesel dependent. Where diesel reigns supreme, the focus has been on conserving power and reducing the amount of fuel being consumed on heating. But what about doing away with diesel entirely? It’s not that far-fetched—as long as Northerners are willing to get creative. The PolarGrizz Lodge’s late-owner Roger Kuptana proved you don’t necessarily need sunlight for solar power to add to your grid. Well, at least, not all the time. In the depths of winter, Sachs Harbour receives no direct sunshine for more than two months, but Kuptana installed a 4.3-kilowatt photovoltaic system at his B&B in 2010 and watched his power bills drop almost $800 per month during sunny months. The Lutsel K’e Dene First Nation is completing the commissioning of a 35-kilowatt solar photovoltaic array for the community of 300 on the East Arm of Great Slave Lake. Once it’s up and running (and an all-important power purchasing agreement is negotiated) the First Nation will sell power back to the Northwest Territories Power Corporation, becoming the first small-scale independent solar power producer in the territory. Kuptana installed a 4.3-kilowatt photovoltaic system at his B&B in 2010 and watched his power bills drop almost $800 per month during sunny months. Polar Tech’s Gord Olson has been pitching a wind-and-solar-powered street lamp to mining companies and local government. At a cost of roughly $11,000, the portable lamp runs two 40-watt LED and doesn’t require any further attention: the battery recharges with two hours of sunlight—and that’s without any wind—making it a bright idea for miners and subarctic towns alike. This is Boréale Mountain Biking’s first full winter in their new home, Boréale Ranch, between Whitehorse and Carcross. Previously, the company offered its all-inclusive mountain biking vacations from a seasonal off-grid base on Whitehorse’s Long Lake Road, where clients lived out of luxury yurts run on solar power with a generator for backup. But even now that owners Marsha Cameron and Sylvain Turcotte are based out of a year-round lodge, and connected to the electrical grid, they’re still committed to solar. “We’ll be implementing our solar energy system in this house,” says Cameron. And since they’re on the grid, any surplus energy their panels produce after they’re installed this coming summer will go back into the territorial energy pool, through the government’s Micro-generation Program (see sidebar). The lodge, says Cameron, is “as energy efficient as could be”—spray-foamed and insulated “to the max” and fitted with a heat recovery ventilation system. Not long after Diavik’s plan proved a success, another northern Canadian mining operation, Glencore’s Raglan nickel mine in Quebec, starting putting money into its wind ideas. At Diavik, power generated from the turbines is fed directly into the mine’s grid, meaning it fluctuates from moment to moment. 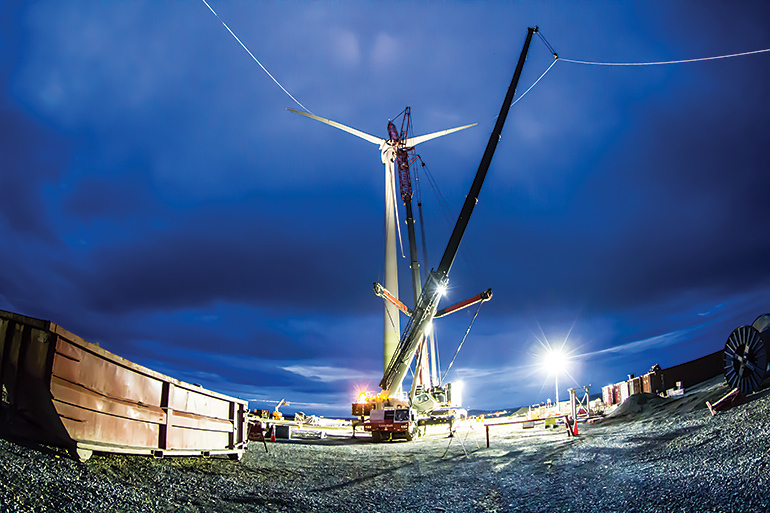 At Raglan, Glencore decided it wanted to retain some of the wind power being generated with battery, flywheel and hydrogen storage systems. In August, Glencore erected a 3.0-megawatt Enercon wind turbine, which is expected to save the company 2.5 million litres of diesel annually. Glencore hopes to add more turbines in the future. The project received a total of $6.5 million in funding from the province, which is closely monitoring progress to potentially roll out turbines in some of the more remote (and diesel-reliant)communities in Northern Quebec. Northerners are ahead of the game when it comes to using biomass—wood pellets, regular old cord wood or other wood scraps—for their space heating needs. For instance, the NWT is responsible for more than 10 per cent of the country’s domestic wood pellet consumption. Brad Mapes, a Hay River entrepreneur, is currently working on building a wood pellet plant in the Northwest Territories that would produce 100,000 tonnes of high-quality pellets annually. And in Fort Providence, NWT, a local group is in early discussions to possibly install a combined heat and power wood pellet boiler, which would see it heat and power multiple buildings by burning biomass. When Sieg Philipp built Fort Providence’s 35-room Snowshoe Inn, 50 years ago, he was already thinking off the grid. He set up his own generators to provide power to the inn, but didn’t stop there. That's because, for each litre of fuel used by the generators, only one-third of what’s burned produces electricity. The rest of the energy goes into a water jacket to cool the generator, or escapes as noise and heat. Iqaluit has some of the highest tides in the world—which is why a new company, Apqak Renewable Energy, recently pitched city council a plan to harness those tides to generate power. Securing turbines to the seafloor, the company thinks it can generate roughly 10 megawatts of power for the Nunavut capital, which relies 100 per cent on diesel. Apqak has hired engineering firm Hatch Ltd. to perform a study on the viability of tidal power generation in the bay. With its disasters well-publicized and the tragic history associated with uranium mining in Délı¸ne, there are good reasons why nuclear power is taboo in the North. But is it worth another look? Toshiba’s 4S micro sodium reactor design, for instance, is capable of pumping out 10MW of power (easily enough to power most Northern communities) without requiring any refueling over its 30-year lifespan. Galena, an Alaskan town of 470, had seriously pursued the idea, but regulatory hurdles proved too many. And Diavik considered a modular nuclear reactor before siding with wind, due in part to regulatory uncertainties. We might not see any nuclear power North of 60 until attitudes thaw.